Leadership communications is a continuous job. Messages must be communicated and recommunicated in ways that make them understandable and credible to various audiences and able to be acted upon by those audiences. This process is called sustaining the leadership message. In addition, the leader must connect with his or her people on a personal level in order to build a sense of trust. When a bond of trust has been established, the future becomes possible. People will be inspired to follow, and in the process they will achieve inspired results for themselves, for the leader, and for the organization. Part III focuses on sustaining the leadership message through a variety of communications methods, including coaching and storytelling. You will learn how to use communications as a core leadership behavior to achieve inspired results through the actions of the people you lead. Morale is the state of mind. It is steadfastness and courage and hope. It is confidence and zeal and loyalty. . . . It is staying power, the spirit which endures to the end - the will to win. With it all things are possible, without it everything else . . . is for naught. In fact, actor-turned-President Ronald Reagan spent the bulk of his time doing what he did best - communicating. He worked hard at his speeches, and he delivered them with the practiced skill of an actor. In fact, Lou Cannon, his biographer, has written that Reagan was very proud of his acting ability; he took umbrage at political enemies who sought to dismiss him and his policies by calling him a lousy actor. Reagan wondered how anyone could function as president without acting experience. The key word to remember is engagement - getting the audience to look, listen, and respond. But how do you engage an audience? By appealing to its intelligences. All of us have more than one type of intelligence. According to psychologist and author Howard Gardner, we have at least seven, covering mind, body, and spirit. All too often, presentations appeal only to the intellect, ignoring our physical, emotional, and spiritual sides. Engaging the body. Create movement. Encourage the audience to get up and move with you. Revivalist preachers invite those who feel the spirit to come to the front. Why? Because they know that when a person is engaged physically, she or he is more likely to be engaged in mind and spirit. Colin Powell is a polished professional speech-giver; he gesticulates on cue, but with conviction. By contrast, Bill Veeck was a jumble of seemingly distracting activities - he would tousle his hair or scratch his wrist. But each of these men used his physicality to make appropriate points. Thank the audience. Entertainers are perpetually thanking the audience for its patronage. Leaders can learn from this example. Recognize individuals in the audience for special achievement. Take a moment to thank the group for achieving a milestone or even for coming to this gathering. Do not overdo it, but acknowledge the audience for its participation. Mother Teresa thanked contributors to her mission through speeches and words, but she also thanked God for enabling her to carry out her mission. These types of communications reflected on how Mother Teresa saw herself - as an instrument in the service of a higher power for a greater good. Interactive is the twenty-first-century word for getting people involved in what you are presenting. Here are some ideas you may wish to consider. Pick and choose those tools that complement your style and the expectations of your audience. Interact with games. Those who teach adults, either as instructors or as trainers, typically have a selection of books containing games. Ask to see these books or seek them out in bookstores. Icebreakers, those that encourage people to interact with one another, work best. Keep the exercise to less than 5 minutes. Interact with music to set the mood. Before you step on stage, play some "walk-on" music, i.e., a light, easy-listening melody that encourages the audience to settle down. Interact with lighting. Arrange to lower the light level before you go on stage, then bring it up gradually. Maybe lower it when you are making a dramatic point. Interact with your product. If you are presenting a product, let the audience experience that product for itself. You can explain the features and benefits, but let the product demonstrate itself. Invite the audience to touch and feel the product. Interact with the Internet. Many presenters augment their presentation with images from a web site. Some even hold teleconferences over the Internet. If you choose this e-avenue, make certain that you use a projection screen large enough for everyone to see. Interact with props. One effective technique is the lone chair. Place it on the stage. You may sit on it, place your foot on it, or even create an imaginary dialogue with it. Interact with clothing. Something you wear can be a prop. Often a presenter who is wearing a suit will stride to the podium and make a point of taking off his jacket and rolling up his sleeves. By doing so, the presenter sends a signal that the mood will be informal and down to earth. Engaging the audience is a presenter's chief responsibility. As we have shown, there are many ways to stimulate an audience response. The challenge for the presenter is finding the right balance between message and staging. Sometimes words alone are enough. Other times, you may need both visuals and interactive games. Whatever the method, the outcome must be the same: engaging the audience's attention. Theatricality may not be suitable for all occasions. It may be expected of professional presenters, but it may be frowned upon when you are presenting to the board of directors. Boredom is your enemy. Do what you can to banish it from your presentations forever. Leaders continually need to ask themselves why they are communicating. On one level, it is to impart the leadership message as it relates to vision, mission, and values. On a deeper level, it is to strengthen the bonds of trust between leader and followers. Therefore, the manner in which a leader communicates is less important than the content of the message and its impact. Much of Part II concentrated on developing a coherent presentation, using both words and visuals. 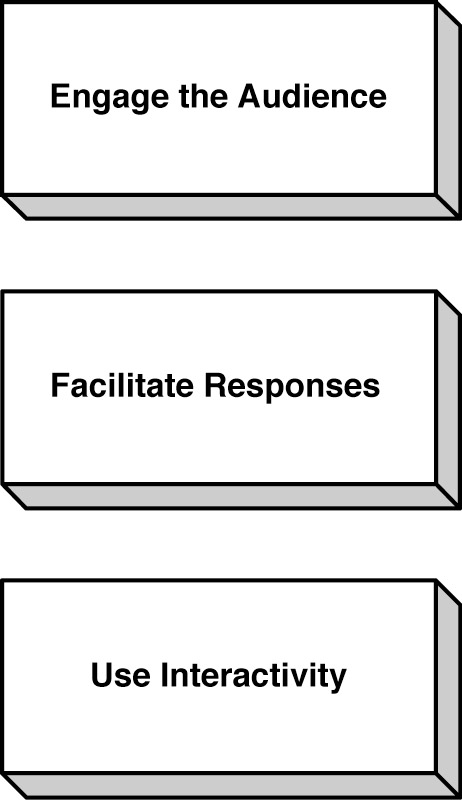 All of the rules of message structure are valid, but the presentation methods may vary. For example, the presenter may choose to give the presentation as a dialogue, asking questions of the audience and proceeding into discussion, debate, and maybe resolution. Other times, the leader may just make an opening statement and invite questions from the audience. As a third option, the leader may come out, tell a story about the business, and invite comments from the audience. The methods of presentation are endless; what is important is the message and its content. One method that is fast gaining in popularity is the facilitated dialogue - inviting a skilled facilitator to conduct a dialogue between the leader and the audience. Turning things over to a facilitator leaves the leader free to concentrate on the message - what does she or he want to say, and why? The facilitator will be briefed in advance and told what points need to be made; it will be up to him or her to bring out these points from the leader and from members of the audience. A facilitated dialogue will still require much preparation - drafting the messages, shaping the presentation ideas, even providing visual support, if desired. The advantages of a facilitated dialogue are that it encourages the participation of both leader and audience. It enables people to contribute their own ideas, and it enables the group to build on the ideas of others. The leader becomes an active participant in shaping the process. Leader and followers collaborate in a shared process that can lead to greater understanding, and ultimately to greater levels of trust. One thing to remember: The leader should have the last word in a facilitated dialogue. This enables the leader to sum up the meeting and take ownership of the process. The leader may invite others to offer their final words, but he or she should be the one to close. This act affirms her or his leadership and responsibility for leading the group. Brief the facilitator beforehand. Let the facilitator know the issues and the topics to be discussed. Ask the facilitator to develop a list of questions to ask the leader. Invite the facilitator to provide periodic summaries of the discussion so that everyone in the group stays together. Ask the facilitator to summarize, but then invite the leader to close the dialogue. The bottom line is that leadership communications is about content and meaning. A facilitated dialogue can be a wonderful way to explore new ideas as well as to affirm organizational values and create deeper levels of trust. Getting the audience's attention and maintaining it is the presenter's chief challenge. Beyond words and visuals, presenters can use their imagination to grab the audience's eyes and speak directly to their souls. Develop a "get to know me" pitch for the start of every presentation. This should let the audience know who you are and what you will do in your presentation. Consider learning a magic trick or a simple juggling maneuver. Practice it until you can do it in your sleep, or in front of your friends. Look for opportunities to introduce it into a presentation. It may be an opener; it may be a closer. Think about how and where you can use it. Practice different ways to demonstrate your product. If it is something tangible, let the audience touch and feel it. If it is a service, invite the audience to experience it. Consider reversing the order of presentation. Maybe you will lead with the benefits and close with the features, or perhaps you will lead with the features and close with the benefits. Talk to corporate trainers. Find out what games they use to engage the audience's attention. An easy way to find some titles is to do a search in a virtual bookstore. Choose the words games for trainers. Window-shop. Look at how the merchandisers have dressed the store windows to attract your attention. See how the lighting and staging present the merchandise in the most appealing fashion. Ask yourself if there is a way you can present yourself more theatrically. Perhaps you could wear a new suit, a funny tie, or a clown nose. Have a conversation with an elementary school teacher about how he or she maintains attention when presenting a lesson. You will be surprised at the variety of tools that teachers of the very young use: pictures, songs, musical instruments, and toys. One or two may be appropriate for your next presentation. Visit the theater. Watch how actors add body movement to the words as a means of bringing their characters alive. She radiated holiness pure and simple. She was drawn to the poorest of the poor, and as a result the world was drawn to her. She was Mother Teresa. Founder of a religious order and a Nobel laureate, she lived as she died, in Calcutta tending to those in need. One of the ways she was able to achieve what she did - always for others - was through her unique ability to communicate. Through prayer, through meditation, through interviews, and through her own writings, Mother Teresa demonstrated an ability to bring people to her cause. The facts of her life are straightforward. Born in Skopje in what is now Macedonia, Agnes Gonxha Bojaxhiu was Albanian by heritage. She was inspired to go to India after learning about it from missionaries who spoke at her school. She joined an Irish order, the Sisters of Loreto, moved to India, and became a school principal. Wanting to do more, she founded her own order, the Missionaries of Charity, based on Franciscan principles of service to those most in need. She founded her order with some fellow nuns in 1948 with no funds to speak of. Upon her death nearly 40 years later, her order had grown to include 4000 nuns and 120,000 lay workers treating the disenfranchised who were suffering from leprosy or AIDS as well as hunger and malnutrition in some 450 missions around the world. She also became a citizen of India, demonstrating her solidarity with the people she served first. Mother Teresa was not comfortable with the label of "living saint." It is true that she had an aura, a kind of charisma, that drew people to her. But she was also very human. A documentary about her, done over a 5-year period, depicts in gritty detail the world that was her life. As one reviewer put it, "The frail figure huddled inside the Indian sari is clearly a force, a soft-spoken lode of iron reserve. The deeply committed no-frills humanity comes through." When asked what it is like to be a living saint, Mother Teresa responds, "I have to be holy in my position. That's nothing extraordinary. It's my simple duty. We have been created for that." Also depicted in the film is her visit to Beirut in 1982 at the height of the fighting between Muslims and Christians. Mother Teresa wishes to retrieve a group of spastic children who were isolated in an abandoned hospital. A priest says it's a good idea, but it's impractical because the hospital is in a free-fire zone. To which Mother Teresa responds, "It's not an idea. It's our duty." At her insistence, a cease-fire was arranged and the children were rescued. Like many leaders, Mother Teresa was a powerful storyteller. Many of her writings tell of the people she has encountered and what they have taught her. Rather than assuming some kind of superior role, she paints a portrait of herself as a seeker. She was famous for telling the story about the first person to whom she ministered. The woman's body was half-eaten by rats; instead of revulsion, Mother Teresa saw "Christ in his distressing disguise." And in her Nobel Peace Prize lecture she tells the story of a bedridden man whose only joy was smoking. He abstained from tobacco for a week and sent Mother Teresa $15 for the mission. "It must have been a terrible sacrifice for him but see . . . how he shared. And with that money I brought bread and I gave to those who are hungry." Although Mother Teresa was strictly Catholic in faith, she was liberal in reaching out to others, seeking to help all regardless of their faith as well as receiving aid from anyone of any faith. She also saw her ministry as taking care of the poor and sick, not as proselytizing: "Love has no other message but its own. . . . If we do any preaching, it is done with deeds, not with words. That is our witness to the gospel." A considerable body of literature is growing up around Mother Teresa. Some of her writings have been collected as inspirational texts. Another book is a collection of reflections from the famous (e.g., Senator Ted Kennedy), from religious leaders, and from ordinary people who met her only once. All of these are testaments to the power of her example, and these communications serve to extend her message further. Those from the secular world found Mother Teresa a holy individual, but many of them did not agree with her doctrinaire support of the Church's position on contraception and abortion. Mother Teresa did not turn them away. Similarly, she accepted an award from dictator Baby Doc Duvalier of Haiti and laid a wreath at the tomb of Enver Hoxha, the communist tyrant of Albania. Critics assailed her. Mother Teresa was not bothered. She "saw Christ in them, and believed they could be redeemed." For all the talk of Mother Teresa's saintliness, she also was very human. In excerpts from her diaries published after her death, we see a woman who is more like us - plagued by doubts. "In my soul, I feel just the terrible pain of loss, of God not wanting me, of God not being God, of God not really existing." Those words were from a journal she kept between 1959 and 1960, when she was urged by her confessor to keep a record of her thoughts. Thirty years later, she seems much more at ease. "I have begun to love my darkness, for I believe now that is a part, a very small part, of Jesus' darkness and pain on earth." Mother Teresa writes eloquently of love as a healing force and how it is necessary to love others in order to heal their physical afflictions. She also writes of the joy of giving, doing it for love, not for duty. "God loves a joyful giver. . . . A joyful heart is a normal result of a heart burning with love. Joy is strength." The greatest legacy of a leader is the continuation of his or her work after he or she has passed from the scene. In the year following Mother Teresa's death, the Missionaries of Charity added some 20 new centers. Her successor, Sister Nirmala, accounted for the growth this way: "It's God's work. If it was Mother's work, maybe in the course of time it would [have ceased], but since it's God's work, it is the same." Whether God has anything to do with it is an eternal question. What there can be no question about is this: It is the example of Mother Teresa that continues to bring the poor to her missions and to draw people who are committed to serving them as she herself did. Understand the power of words. Mother Teresa wrote a number of mediations and reflections. These help readers gain a perspective on life and the world. Take a stand. Mother Teresa vowed to work among the "poorest of the poor" and did so, overcoming many obstacles in her journey. Enlist the support of others. Mother Teresa was forever inviting people who came to visit to help her cause. Some stayed and worked as she did; others provided support in other ways. Use the media. At first Mother Teresa sought no publicity, but soon she realized that if she were to achieve her aims, people throughout the world would have to hear her message. Live your message. Mother Teresa is the embodiment of living the message. The sanctity of her life resulted from her commitment to others and her selfless desire to help the least fortunate. "I feel I could not sleep at night with you out of the country," said Franklin Roosevelt. And with those words General George C. Marshall's lifelong ambition of commanding troops in battle was denied. Dwight Eisenhower, an officer he had developed and promoted, would get the supreme command in Europe. Roosevelt had given the choice to General Marshall himself, but, ever the soldier, Marshall had declined. The decision belonged to the commander in chief. This selfless gesture assured the president that the best man for overall command would remain in Washington. As a result, Eisenhower would become the more famous of the two; after all, as Roosevelt himself once said, "Ike, you and I know who was the Chief of Staff during the last years of the Civil War but practically no one else knows. . . . I hate to think fifty years from now practically no one will know who George Marshall was." As Roosevelt conjectured, the contribution of General Marshall has faded from memory. True, World War II was won by the blood, sweat, and sacrifice of millions of citizen soldiers who were fighting for the freedom of others against the evils of totalitarianism. Yet although Marshall did not fight in the trenches, his story is equally heroic, for it was through his efforts and will that America and its soldiers received the men, material, and leadership they needed in order to wage war. While Marshall himself never took fire in this war, he sacrificed his lifelong ambition to lead troops so that he could better serve his nation and the army. In Marshall we have an example of a leader as manager for a heroic purpose; his skillful use of communications was essential to his aims and those of our nation. In 1939 General Marshall was appointed army chief of staff. It was the fulfillment of a dream for a lifelong soldier who had devoted himself to the service of his country. Marshall had had a slow rise through the ranks from second lieutenant in the Philippines in 1902 through outposts in the American West, service under General "Blackjack" Pershing in World War I in France, and then service in Asia, including China. Now, as chief commander of air and ground forces, it fell to Marshall to mobilize the American military for war should it come. The challenges that Marshall faced were enormous. While President Franklin Roosevelt was a supporter of intervention, the American people for the most part were not. Fortunately, Marshall had the organizational skills necessary for the task. The army grew from a force of less than 500,000 at the outbreak of war to 12.9 million at the end. Marshall mobilized American men, women, and material. It was he who made certain that troops were equipped for battle and that generals had the troops, supplies, and armaments that they needed in order to wage war. It is said that the modern army took shape under Marshall's guidance. He served as an instructor at the War College for several years, and he also served as chief instructional officer at Fort Benning, Georgia. Dispensing with textbook planning, Marshall pushed for more realistic exercises, in which commanders would need to make decisions with only partial information, just as on a real battlefield. In doing so, he reinvented the way the military educates its officers. One of Marshall's chief assets was his ability to pick the right person for the right job. At Fort Benning, Marshall identified future leaders and did what he could to promote them. He created the American general corps of the Second World War. His choice of military commanders was meticulous: Generals Dwight Eisenhower, Omar Bradley, Mark Clark, and George Patton were but four of many standouts - all of whom earned a place in his little black book. Time and again Marshall proved himself adept at communicating his point of view without creating rancor, and in the process he gained respect for his position as well as for himself. With Congress, Marshall could be charming as well as informative. He was the same with the Allies, especially Britain. Having seen the folly of disunity among the Allies during World War I, he argued forcefully for a unified command during World War II. He wanted an American commander, but he was willing to put British generals into leadership positions, or even to put an American officer in a subordinate position to a British officer as a means of demonstrating a willingness to cooperate. Marshall drew a distinct line between the military and politics. Throughout the war, by virtue of his position, he was required to testify before Congress. Even though the process was time-consuming and took him away from his military duties, he prepared himself and underwent the rigor of testifying. He also ordered full cooperation with the Truman committee's investigation of military purchasing, rather than stonewalling. The result was twofold: First, Truman's committee uncovered waste and sometimes fraud and in the process ended up saving the nation billions of dollars, and second, he and Truman had the opportunity to assess each other; this paved the way for greater understanding when Truman was thrust into the presidency after Roosevelt's death. Marshall also recused himself from the summits among heads of state that took place periodically throughout the war. He did not think it was wise for a military man to influence political outcomes. At the same time, Marshall was not a political neophyte. Although there were suggestions that he run for office, even for the presidency, he always declined. He knew how Washington worked, and he prided himself on his reputation for being honest and without guile. Periodically, he had to undergo what must have been humiliating examinations - for example, in late 1945 during the investigation of the lack of preparedness at Pearl Harbor, and in the early 1950s when he was wrongly accused by the red-baiting McCarthyites of undermining America's resistance to communist forces, particularly in Asia. With this latter charge, scurrilous though it was, Marshall took the high road, refusing to dignify McCarthy's charges with a rebuttal. His reply: "If I have to explain at this point that I am not a traitor to the United States, I hardly think it's worth it." The decision to drop the atomic bomb on Japan was one that Marshall did not want to make. He fully endorsed the development of the bomb and in fact was the chief overseer of the project: General Lesley Groves reported to him. Marshall understood that the decision to drop it was one that would have profound moral consequences, and for that reason he deemed its use not a military decision, but one for the government to make. However, Marshall endorsed the use of the atomic bomb as a means of shortening the war and ultimately saving the lives of both the American soldiers and the Japanese civilians and soldiers who would be killed if Japan were invaded. Truman so admired Marshall that he twice called him into his cabinet, first as secretary of state and later as secretary of defense. It was in the former role that Marshall gained recognition as a humanitarian. In a speech at Harvard when he was given an honorary degree, Marshall spoke of Europe's suffering and slow recovery and its need for assistance in the wake of the war. The remedy lies in breaking the vicious circle and restoring confidence of the European people in the economic future of their own countries and of Europe as a whole. . . . It is logical that the United States should do whatever it is able to do to assist in the return of normal economic health in the world, without which there can be no political stability and no assured peace. Our policy is not directed against any country or any doctrine but against hunger, poverty, desperation, and chaos. Its purpose should be the revival of a working economy in the world so as to permit the emergence of political and social conditions in which free institutions can exist. The cost of war is constantly spread before me, written neatly in many ledgers whose columns are gravestones. I am greatly moved to find some means or method of avoiding another calamity of war. Very few people called him George; he was always the General. He had an aloofness to him that terrified junior officers, but to Marshall it was a way of getting to the point: A commander's time is limited, and he must maximize his effectiveness. Yet Marshall, like all good commanders, viewed his soldiers as people; the genesis of the USO show was Marshall's requesting entertainment for his troops stateside before the war. During the prewar mobilization, Marshall directed his staff to prepare a summary of messages that newly enlisted men were sending home; many of these messages were complaints. Forrest Pogue, Marshall's biographer, estimates that Marshall spent "twenty minutes a day" reviewing these summaries and personally answering some of the complaints himself. Marshall also visited with the troops as well as keeping in frequent contact with those he had promoted and developed. He understood that he was mobilizing an army of civilians; the military would mold them into soldiers, but they were nonetheless civilians and wanted nothing more than to return home and resume their lives. Their sacrifice and their service were "the essence of democracy" and "what the fighting was all about." Another of Marshall's traits was a willingness to listen. General Omar Bradley tells of being called into Marshall's office in 1939, a week after the outbreak of the war in Europe. Marshall expressed his disappointment in Bradley and his fellow officers: "You haven't disagreed with a single thing I have done all week." The next day the officers returned with a recommendation that in Bradley's recollection seemed "questionable." To which Marshall replied, "Now that is what I want. Unless I hear all of the arguments against something I am not sure whether I have made the right decision or not." After Pearl Harbor, Marshall called Ike to his office and told him to draft a plan to save the Philippines. Ike took a few hours, then reported that it was not possible but suggested alternatives. Marshall said, "Eisenhower, the department is filled with able men who analyze their problems well but feel compelled always to bring them to me for final solution. I must have assistants who will solve their own problems and tell me later what they have done." To General Marshall, leadership was not about pleasing the boss or saying the right words; leadership was doing the right thing. This was the creed by which he lived. Anyone who came into contact with George Marshall respected him. His sense of virtue was palpable. Throughout his long years in the military, often doing jobs he did not particularly want, he did his duty. His greatest disappointment was failing to obtain divisional command. He was a lifelong staff officer, who served the army and the nation well, and he was worthy of Harry Truman's appellation: "the greatest living American." Communicate your conviction. People need to know where the leader stands. Marshall was clear and forthright on the need for the army to prepare for war, and he let Congress and the president know where he stood. Overcome roadblocks. Leaders have to deal with opposition. During World War II, Senator Truman headed a commission to investigate fraud and waste in military spending. While Marshall would have preferred to concentrate on war issues, he understood the benefits of cooperation and won Truman to his side. The commission also saved the American taxpayers billions in unnecessary spending. Be persistent. Achieving goals may take time. Marshall is the embodiment of persistence; it took him more than 30 years to become a general, and not until he was nearing retirement did he become chief of staff. Be willing to make sacrifices. You may have to put aside your ambition in order to lead. Marshall wanted to lead troops, but his skills as a manager kept him in staff roles, and as a result he was the best officer for the job of mass mobilization prior to World War II. Be sensitive to morale. Leaders need to create conditions in which people can do their jobs. Combat is not where soldiers want to be, but Marshall insisted that they be fed, equipped, and supported adequately. He also wanted them to have some touches of home; hence the establishment of the USO shows to entertain the troops at home and abroad. Know your limits. A leader must know where he or she can do the most good. As a general, Marshall steered clear of political strategizing, believing that a soldier had no role in it. Later, as secretary of state, he proved to be an adroit statesman. Be seen as the leader. Let people know that you are in command. Marshall not only led the army, he helped lead Congress as it wrestled with decisions on armament for a nation preparing for and waging war. Live your message. For more than a half-century, Marshall put service to his nation first - as a soldier and a diplomat. His integrity and his honor were forthright and are stellar examples to us all. "Mother Teresa," Economist, Sept. 11, 1997. Leo Seligsohn, "A Portrait of Mother Teresa in Action," review of Mother Teresa, a film by Ann Petri and Jeanette Petri; Richard Attenborough, narrator and consultant. Mother Teresa, "Nobel Peace Prize Lecture," Dec. 10, 1979. Mother Teresa, No Greater Love, ed. Becky Benenate and Joseph Durepos, with a foreword by Thomas Moore, p. 179. Laurinda Keys, "Mother Teresa's Writings Reveal Doubts about God," Seattle Times, Sept. 15, 2001; quotes were from Vidayajyoti (Light of Knowledge), a Jesuit journal published in New Delhi, India, March 2001. Mother Teresa, No Greater Love, p. 33. Mother Teresa, "Nobel Peace Prize Lecture." Neelesh Misra, "Shared Burden: Mother Teresa's Nuns Carry Out Work," Associated Press, Orange County Register, Sept. 5, 1998. Ed Cary, George C. Marshall: Soldier and Statesman, pp. 4-13 (Roosevelt quote, p. 13). Ibid., pp. 9-13 (Roosevelt quote, p. 9). Robert D. Kaplan, Warrior Politics: Why Leadership Demands a Pagan Ethos, pp. 13-14, citing Barbara Tuchman, Stillwell and the American Experience in China. Also Forrest C. Pogue, George C. Marshall: Education of a General (1880-1939) , pp. 247-262. Pogue, George C. Marshall: Education of a General, pp. 247-262. Cary, George C. Marshall, p. 274. George C. Marshall, "Text of the Marshall Plan Speech," June 5, 1947. Forrest C. Pogue, George C. Marshall: Statesman 1945-1959, pp. 506-507. Cary, George C. Marshall, pp. 6-7. Forrest C. Pogue, George C. Marshall: Ordeal and Hope (1939-1942), with a foreword by General Omar N. Bradley, pp. 114-119. Omar N. Bradley, foreword to George C. Marshall: Ordeal and Hope (1939-1942), by Forrest C. Pogue, p. ix. Cary, George C. Marshall, pp. 265-266.